Millions of unemployed Americans are waiting for Congress to do something other than trade barbs over their job creation plans. If lawmakers don't act soon, the jobless see their unemployment checks start to disappear come January. 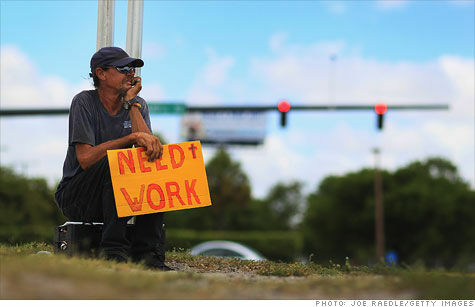 More than 6 million Americans are set to lose federal unemployment benefits in 2012, with 1.8 million running out in January alone, according to new figures from the National Employment Law Project. President Obama's $447 billion American Jobs Act would extend the deadline to file for federal unemployment benefits for another year. Though the Senate is expected to take up the controversial jobs bill on Tuesday, it's unlikely to get very far. While many Washington observers say the administration's jobs bill is dead in the water, it's possible the unemployment extension could be separated and sent through on its own, or as part of another bill before year's end. The extension is estimated to cost $44 billion, according to the Congressional Budget Office. Extending unemployment insurance is one of the few areas that has some bipartisan support. While some Republicans and conservative experts feel that jobless benefits dissuade people from taking new jobs, many lawmakers are hesitant to cut off the checks when unemployment remains at a stubbornly high 9.1%. Supporters, meanwhile, say unemployment benefits are an essential lifeline for the jobless, especially since work opportunities remain sparse. There were 3.6 million people collecting federal unemployment benefits as of mid-September, according to the Labor Department. "If you don't extend unemployment insurance, things will get worse and they'll get worse in a big way," said Judy Conti, NELP's federal advocacy coordinator. The average time that the unemployed have been without work hit a record 40.5 weeks in September. Also, some economists say unemployment benefits stimulate the economy since the jobless usually spend their checks right away. Still, getting another extension past lawmakers will take some political wrangling. Federal emergency benefits began in June 2008 and have been increased or extended eight times since then, including on four occasions last year. When Congress passed a 13-month extension last December, it was thought by some to be the last. Here's what's at stake: The jobless can collect up to 26 weeks of state benefits before shifting to the extended federal program. Federal benefits consist of up to 53 weeks of emergency compensation, which is divided into four tiers, and up to another 20 weeks of extended benefits. The maximum is 99 weeks. So those who reach the end of their state benefits after early January will not be able to apply for federal benefits unless the deadline to file is extended. Same goes for those now collecting federal benefits, who will not be able to advance to the next tier once they finish their current one. One potential area for compromise involves a larger overhaul of the unemployment insurance system. Republicans, particularly in the House, are interested in giving states more flexibility in their use of unemployment benefit funds and providing more job training opportunities. When he unveiled his jobs proposal last month, Obama called for "the most sweeping reforms to the unemployment insurance system in 40 years." The expanded goal: helping the jobless transition back to the workplace. Republicans could get on board with some of the initiatives, which include enhanced training, reemployment and startup opportunities. House Majority Leader Eric Cantor last month identified unemployment insurance reforms as an area of potential common agreement. "Unemployment benefits should not turn into a permanent solution," he said last month. "We should somehow connect the unemployed and unemployment benefits with work and job opportunity."